It has been a week now since the Fed’s QE3 announcement that it would be again buying mortgage backed securities (MBS). There was an initial decline in the mortgage spread on the announcement but, as often happens, that initial impact seems to have been eroding away day by day. 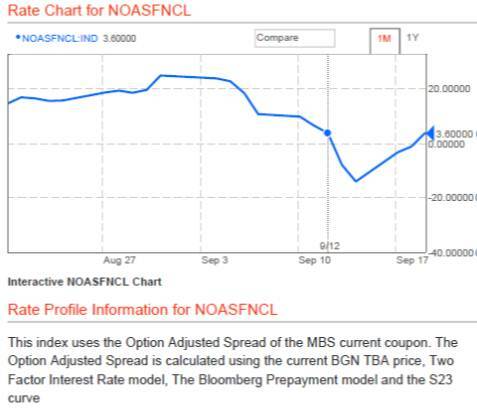 Take a look at this Bloomberg chart of the option adjusted spread (OAS) for mortgage securities. Wednesday September 12 is marked so you can see the effect on Thursday September 13 when the Fed made the announcement. The spread moved down again on Friday, but this week it went back up. By Wednesday September 19 it had completely returned to the pre-announcement value. The effect on the spread has eroded away. Of course, the effect of the announcement could already have been discounted before September 13, in which case some of the earlier downward movements could be attributed to QE3. Nonetheless, this real time experience is a good illustration of why announcement day measures—which the Fed has relied on to assess its LSAP programs—can be misleading. This is why Johannes Stroebel and I used other techniques in our analysis of the earlier MBS program, in which we did not find significant effects. One should also note that the effect on mortgage rates depends on what happens to other rates, such as Treasury yields, as well as the spread. But the yield on 10-year Treasuries has risen since QE3. So in effct, the overall effect on mortgage rates could even end up being counter to the Fed’s intentions in the end.